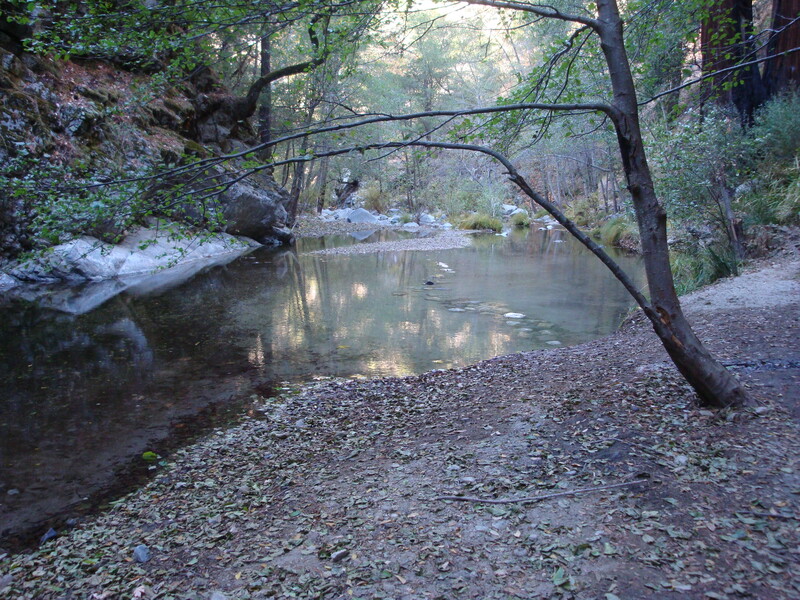 Thanks to a small, lukewarm spring, Sykes Camp is by far the most popular Ventana Wilderness destination. For decades, locals have been complaining about Sykes being overrated, overcrowded, and festooned with trash and human waste. 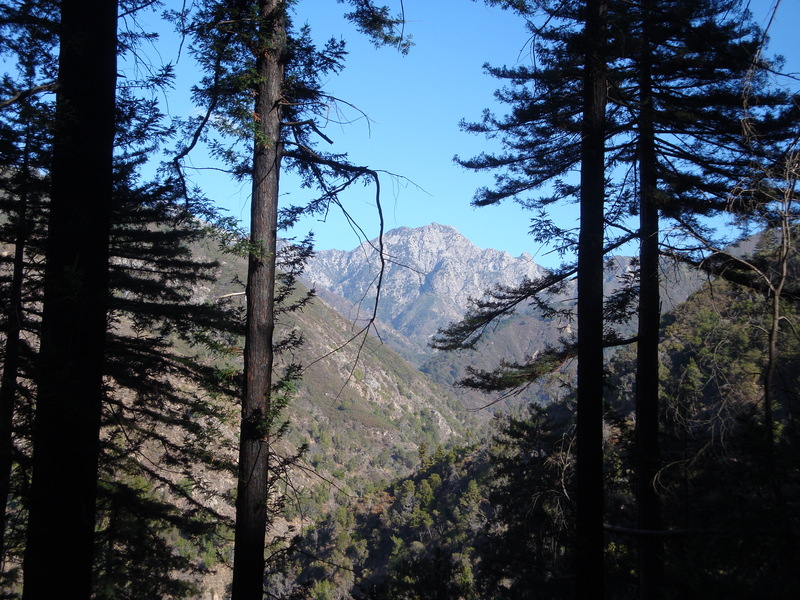 But recently there have been rumblings among locals, and on the Ventana Wilderness Alliance Forum, that the problem is actually getting worse and that, perhaps, a quota or permit system should be established. I first saw Sykes during Easter week 1972. We’d started from Chews Ridge and spent the night, with only ourselves for company, at quiet Pine Ridge Camp. 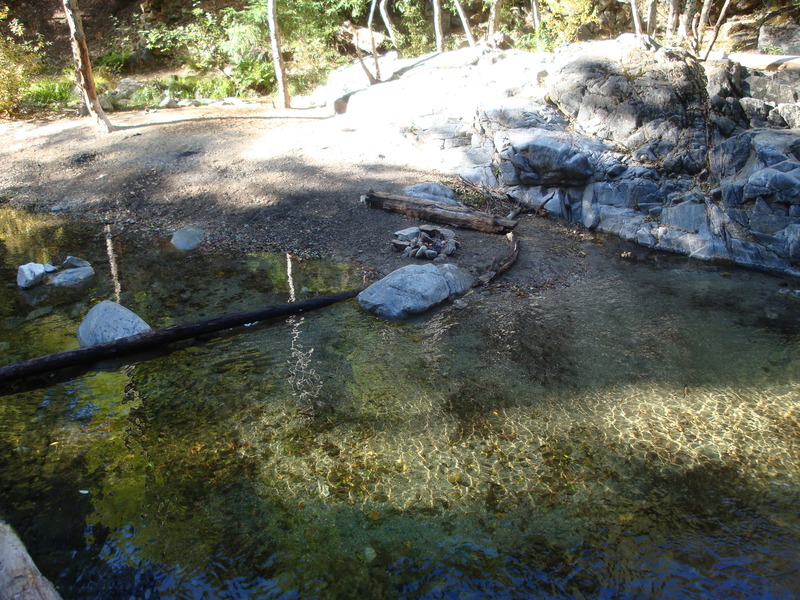 In the morning, we descended to cross the Big Sur River at Sykes. In the fourteen miles from Chews Ridge we’d seen no more than three or four people on the trail, but as we came to the rim of the inner canyon, directly above Sykes, a rumbling cacophony of human voices reached our ears, as though a stadium packed with fans waiting for the start of a game lay somewhere beneath us. The canyon was filled with dense smoke and, as we descended, our noses were assaulted by the signature odor of Sykes: a pungent blending of the pleasant aromas of cooking and campfires with the obnoxious stench of garbage incineration and human waste. I’ve passed through Sykes many times since and, while I’ve never seen it quite that crowded again, that’s probably because I’ve never again visited during a major holiday. The fewest people I’ve ever seen at Sykes were a single group of five semi-permanent looking residents I encountered on a mid-week, mid-winter day in 1976. The temperature was in the low 30’s and they were sitting wrapped in ratty blankets in front of a smoldering fire. As I passed their camp, one of them roused himself enough to ask if I had any spare dope. More typical, over the years, has been to find maybe 20-40 people in camp during the week and, well, who knows how many more on weekends and holidays. So is the problem getting worse? The south face of the Ventana Double Cone as viewed through well-scorched redwoods about two miles in. The bike wasn’t being ridden. Instead it was piled high with gear, including musical instruments, and was being awkwardly pushed along the trail as a kind of impromptu cart by two worn out looking gentlemen who looked like they’d long since realized the full extent of their folly. Next time, I’m sure, they’ll be using packs. 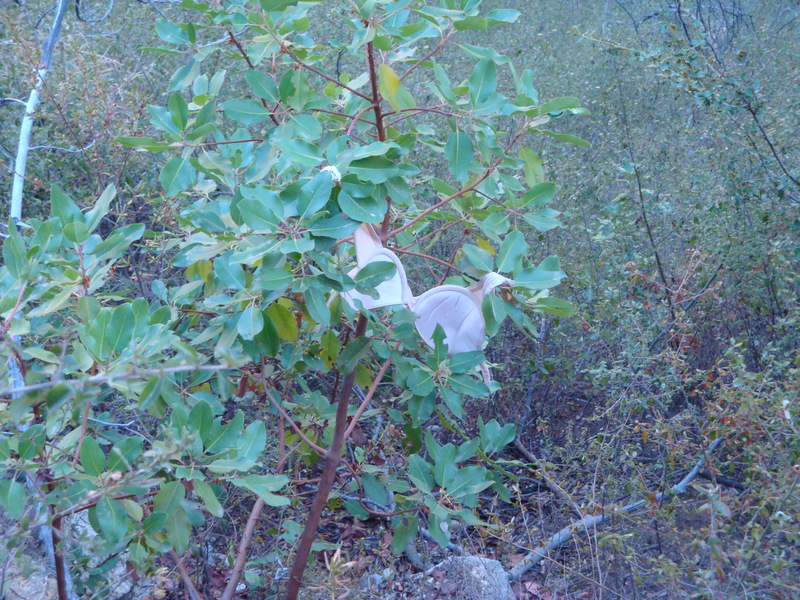 Other than a bit of toilet paper here and there, we didn’t see a lot of garbage along the trail. 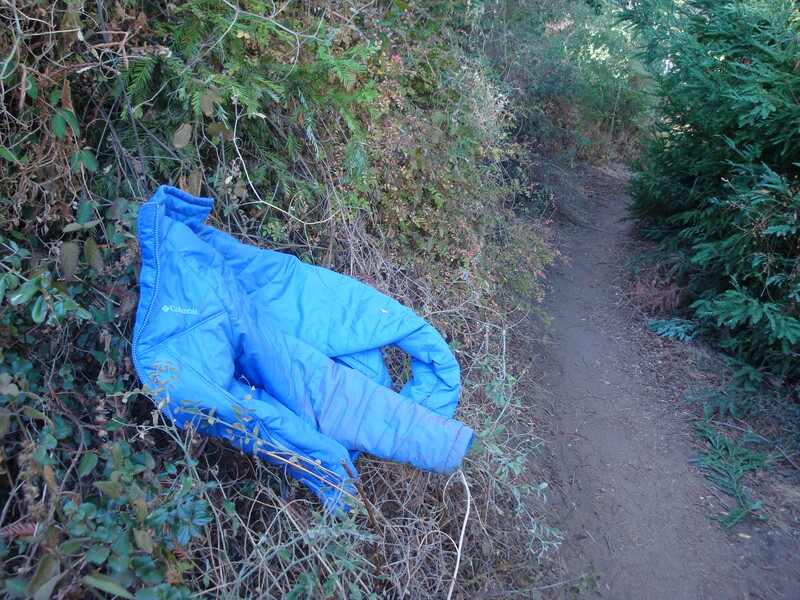 Mainly things (this jacket, shirts, pants, a size 14 boot) that probably shook loose from people’s packs. We saw at least three different bras hanging from trailside vegetation. Not sure what that’s all about. Although Level IV fire restrictions are currently in place, banning campfires, stoves and smoking, compliance does not appear to be particularly good. We saw several fresh cigarette butts along the trail and the fire pit at this use camp had clearly held a fire on Saturday night (it had been thoroughly extinguished, at least). 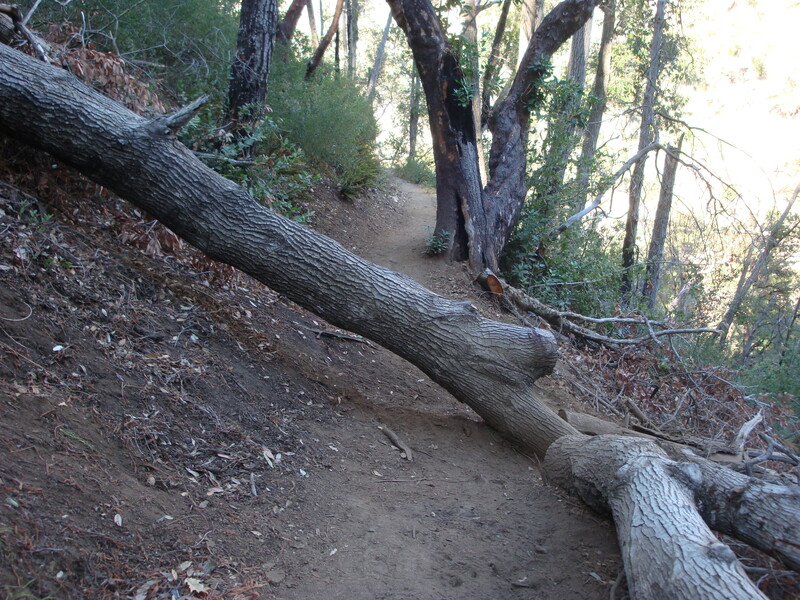 There are about a dozen deadfalls on the trail to Sykes. This one is fairly typical. 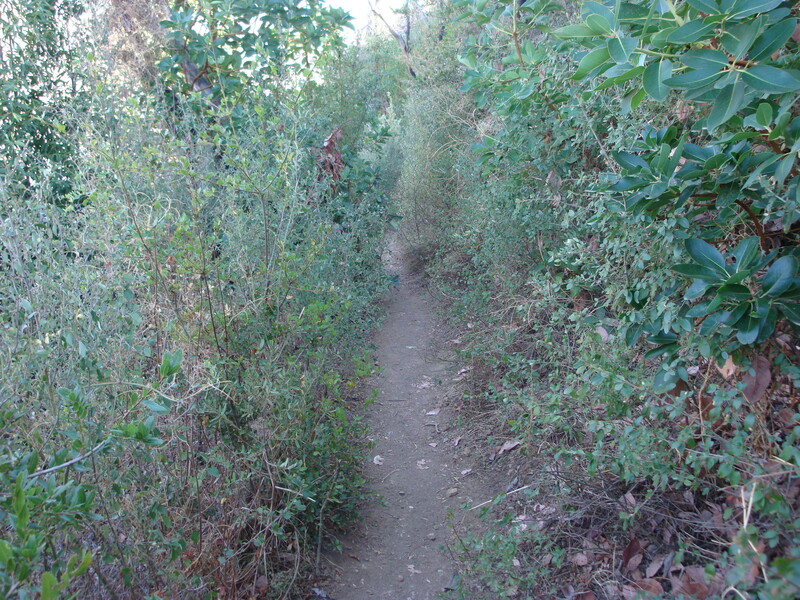 There are also sections of encroaching foliage (including poison oak), but nothing that can’t be easily passed through. 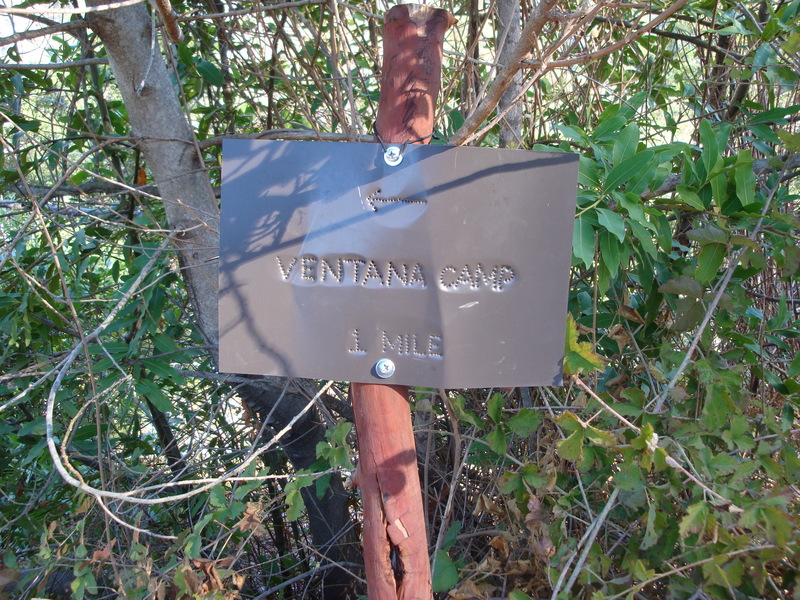 One of the least respected signs in the Ventana Wilderness? The note written on this sign is about all the help visitors get in finding the official toilets. 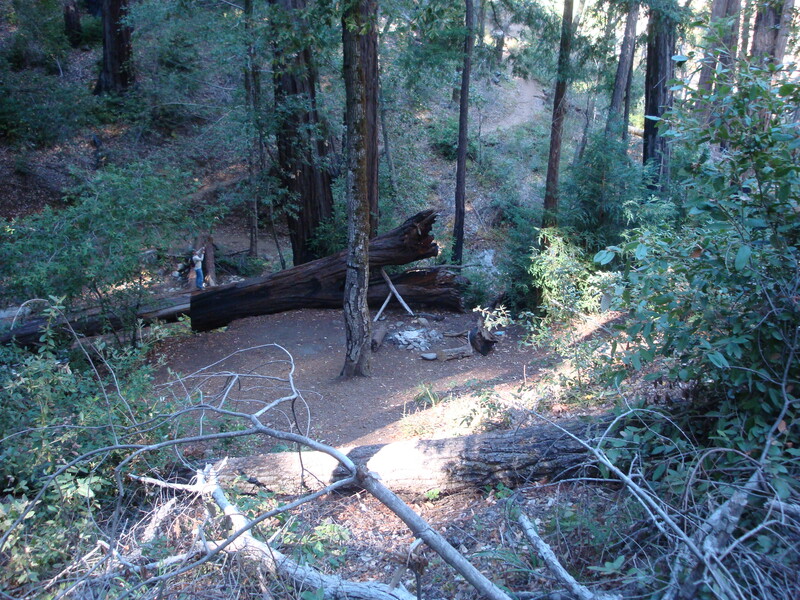 After the hordes we met on the trail, we were surprised to find Sykes Camp itself nearly abandoned. 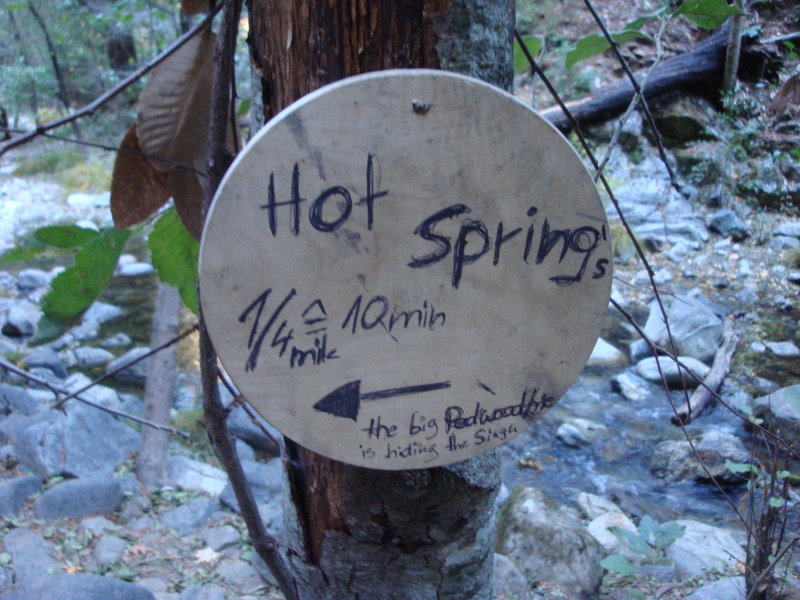 Although there were likely people in the area we didn’t run into, we saw just one occupied campsite and only nine people (most of whom were soaking in the springs). No naked hippies here. The Sunday afternoon crowd at the springs consisted of bathing-suit-clad, real-job-working citizens in the 30-50 age group. 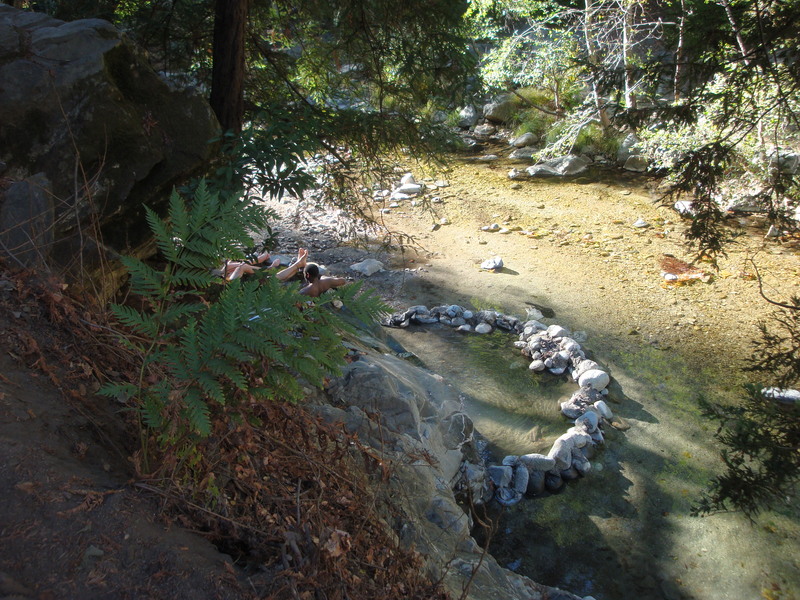 Fire ring built practically in the river, directly across from the springs. Overall, the condition of Sykes Camp was much better than we expected. Although we didn’t venture far beyond the riverbanks, we saw almost no trash or human excrement. There were many fire rings, of course. And nearly all appeared to have been very recently (i.e. within the past 24 hours) used. This good condition is undoubtedly thanks to the Ventana Wilderness Alliance volunteers who, last month, bagged up an enormous quantity of trash. In 40 years of visits this was actually the cleanest I’ve ever seen Sykes – and without all the junk it is a remarkably beautiful place. 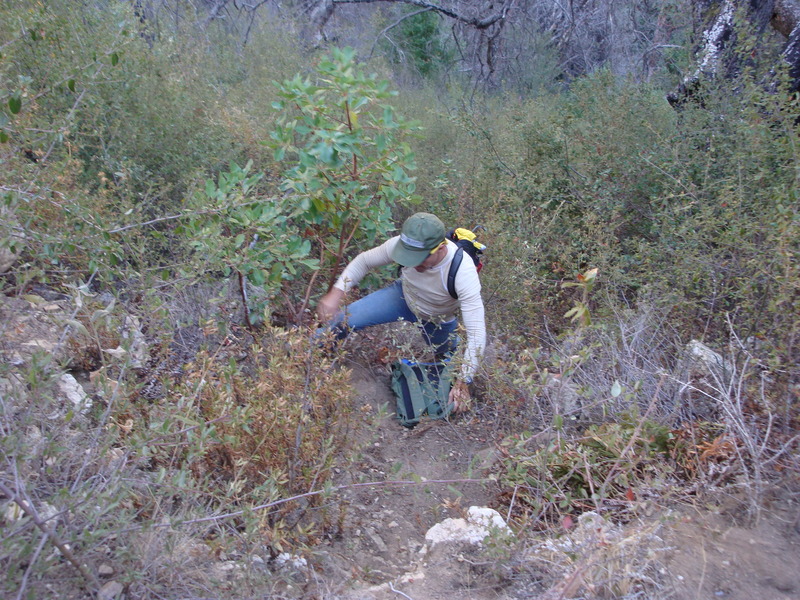 He used to get paid for this: former Forest Service Ranger and Ventana backcountry patrolman, Tim Jensen, retrieving an abandoned pack from the steep slopes beneath the trail. So is overcrowding at Sykes getting worse? Hard to say. It’s been bad for a long time. We certainly wouldn’t choose to go there on a weekend or holiday and live in the refugee camp conditions that prevail at those times, but if the Yelp reviews are any guide, a lot of people clearly enjoy it in spite of, or because of, the crowds. From what we saw, we’d say it’s about the same as it’s ever been. How awful you find it probably depends mainly on how long it’s been since a serious clean-up effort or flood (which amounts to the same thing). The biggest issue is probably sanitation. We think installing new and better pit toilets (one of the two existing overflowing crappers was apparently used for firewood by some cretin earlier this year) together with signage directing campers to the toilets, would probably do more than anything else to alleviate the camp’s most disgusting problem. 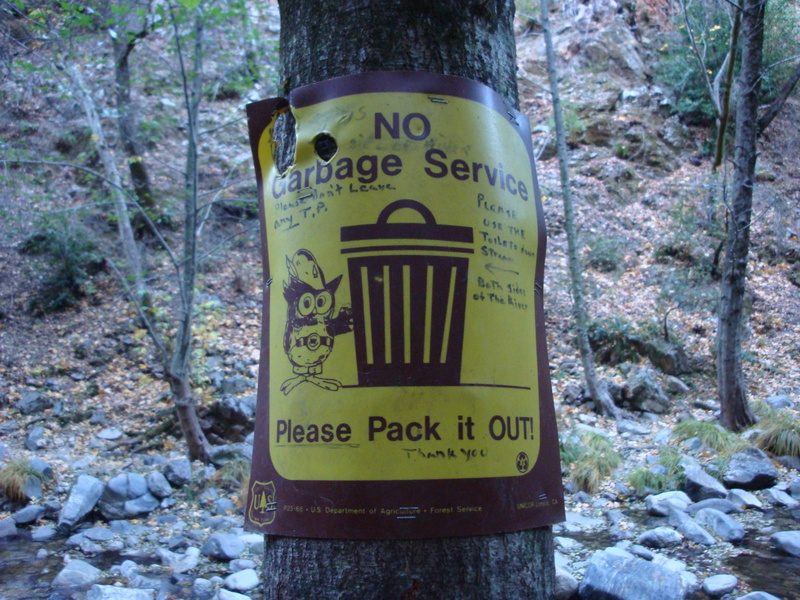 Even with quotas and the provision of Leave No Trace camping information at the trailhead, Sykes will probably always attract more than enough people who simply refuse to clean up after themselves. The sad truth is that unless trash removal efforts, like the one carried out by volunteers last month, take place at regular intervals, Sykes will, as so many times before, sink back into squalor. Sunset over Pfeiffer Ridge, as seen from the Pine Ridge Trail. 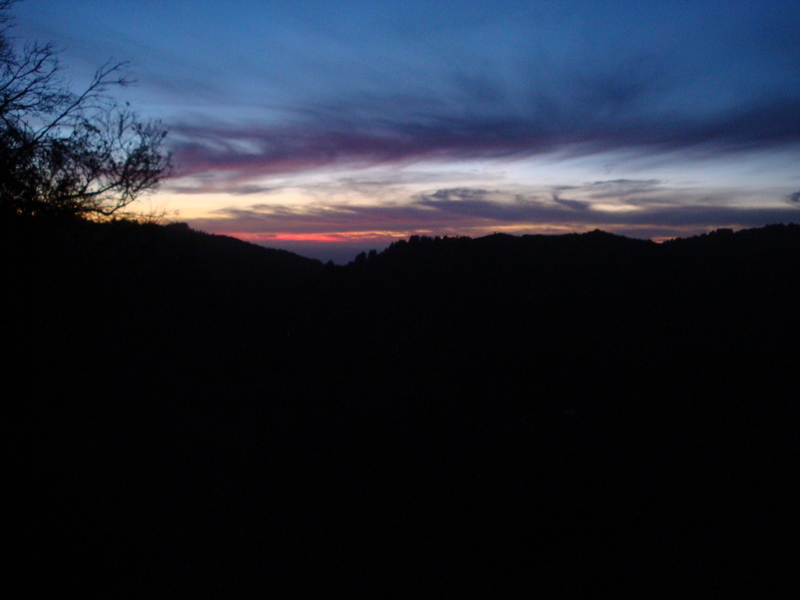 This entry was posted on Monday, November 18th, 2013 at 5:44 pm and is filed under Big Sur, On Foot, Santa Lucias. You can follow any responses to this entry through the RSS 2.0 feed. You can leave a response, or trackback from your own site. 2 Responses to Is Overcrowding at Sykes Camp Getting Worse? Sykes is a cesspool and a public health risk if not maintained. Last time I went for a visit I was treated to a Methicillin-resistant Staphylococcus aureus (MRSA) infection. This stuff can be deadly. I fear it will take a death before public / government action is taken. I hope it doesn’t come to that.